Night of the Living Manuscript « "TeresaBruceBooks"
What lies beneath the sandy soil of Pigeon Point? No ancient Duncan Miller manuscripts, at least not anymore. 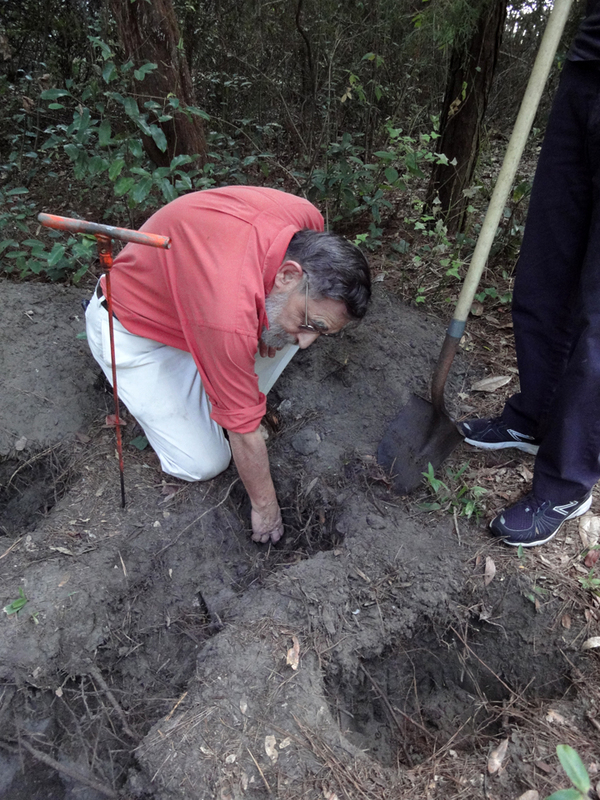 Last week I wrote about our trench-digging efforts to exhume them, which, since we couldn’t remember exactly where we’d buried them or how deep or even how long ago, was an exercise in futility (accent on exercise). But one of my sisters-by-Byrne, Lisa Lepionka, left a comment on this blog that changed everything. 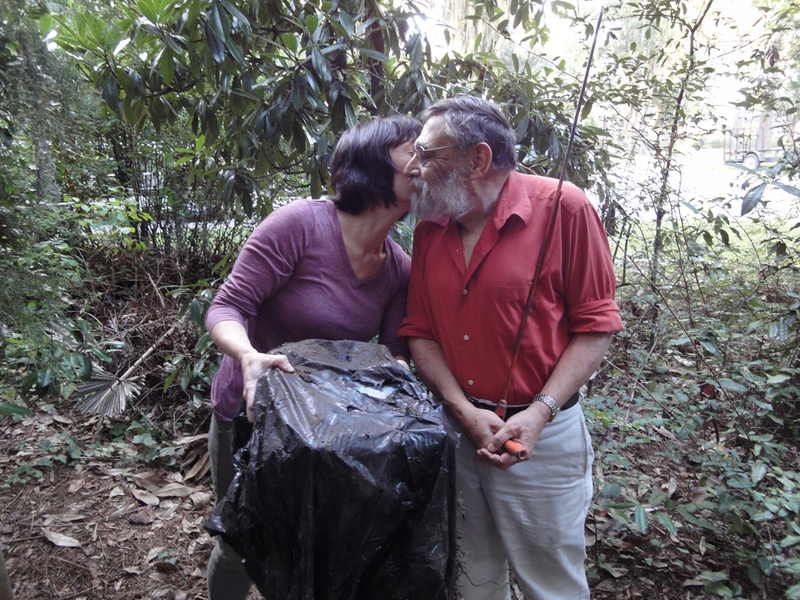 She reminded me that her husband Larry, who used to smoke pipes and read Shakespeare with Duncan, is an archeologist with the proper tools for digs such as ours. I am not proud. I readily admit when I am in over my head and need help. 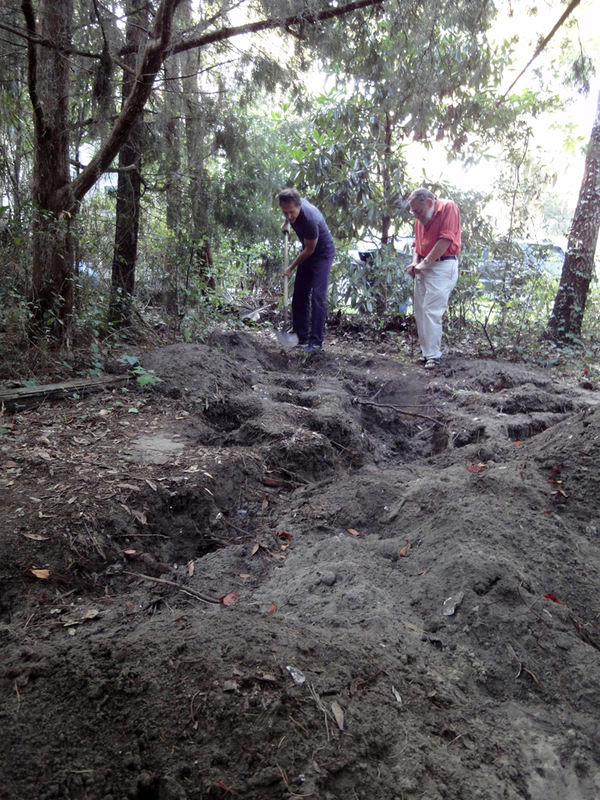 Larry bicycled right over with a pair of industrial strength clippers for buried roots and a bonafide archeologist’s probe and put Gary to work. It turns out when you jab into the soil with a long pointy rod it’s as much about sound as resistance. Metallic pings are usually signs you’ve hit an oyster shell, and tree roots make a sharp, cracking noise when probed. Three thick, hand-typed manuscripts create a resonant thud when you stab through their outer wrapping – and after a week of digging that’s a wonderful sound. The whole search took ten minutes, once the professional arrived. Larry crouched down, started scraping away the earth and professorially announced “we have contact with plastic.” I would have cracked open the tequila to celebrate right there and then, but Larry reminded me that some of manuscripts were 60 years old when the paper went into the ground and if any water had seeped into the pages since then the results would be discouraging. 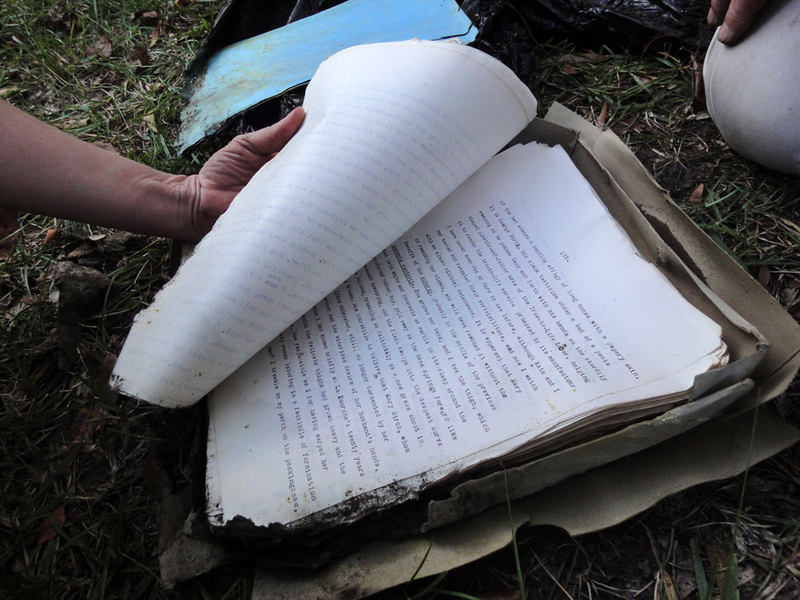 We pried the manuscripts from their grip of secrecy and ripped open the layers of plastic covering. It didn’t look good. 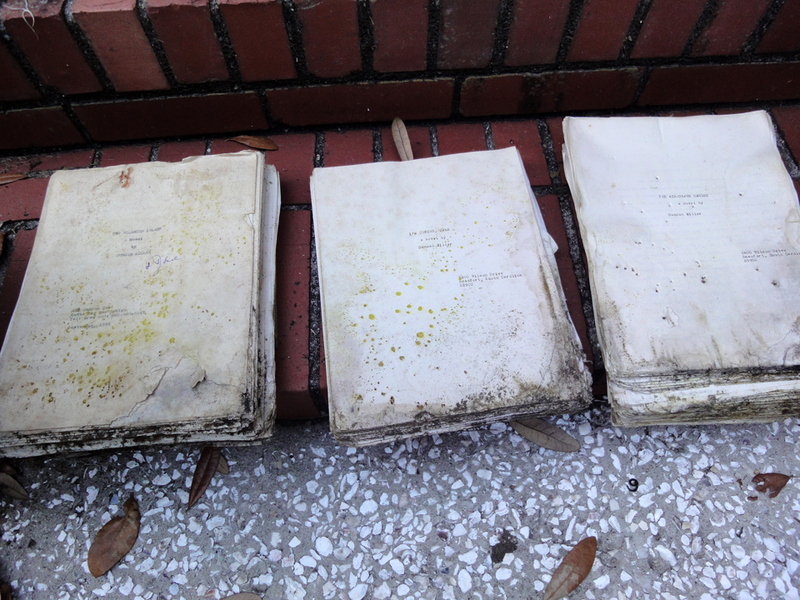 The flimsy cardboard boxes that encased each of the three manuscripts disintegrated in my hands – wet globs of musty dirt. The title pages were spotted with yellow mold and the one that had been on top was now decorated with a cluster of probe holes. Still, Larry says he expected worse. Inside, the pages are still legible – and he says I should be able to read them safely once they’re completely dry and I’ve taken a pastry brush to the clots of dirt. The special collections director at the Beaufort County Library also commented on the last blog – she suggests that after I’m done referencing the manuscripts for my book about Byrne Miller, I store them with the rest of Byrne’s papers. The thing is, Duncan suffered from what Byrne always called “borderline schizophrenia” and his writing is, well, “ribald” might be the best way to describe it. Still, it’s his life’s work and maybe after we’ve all read “Fifty Shades of Grey” it won’t seem so disturbing after all. For what it’s worth, I was told when some library books (or papers)were left outside & got rained upon to store them in the freezer until they could be recovered. Doug Reade is a hand bookbinder and disaster recovery expert, and owner of Reade Books Restoration, a full-service firm in Seattle, WA. They have constructed a freeze-drying unit of unique operation, and can handle over 100 books at a time. Books and papers that have gotten wet by fire, flood, broken pipe or what-have-you can be recovered. Recovered by the homeowner, without extensive training, and without expensive tools (such as the large-scale freeze-drying unit I’ve set up). It is time-intensive, and therefore not for the patience-challenged, nor a good idea if you have a whole lot of stuff, but if you’ve got one or two wet books, and the time to spare, you can get results just about as good as I can. The most important thing, upon which everything else hinges, is get the book frozen A.S.A.P.! Once the book dries out, the wrinkles and warping are set, and there’s nothing anybody can do about it. But freeze it, and all damage stops. And the book can stay frozen, in stasis, until you’re ready to handle it. Wrap the book in a U of wax or freezer paper, or in a plastic bag. It’s best to freeze it at -15F or lower, so if you can get access to a commercial freezer space, it would be a good idea. If that’s not available, a home freezer will do in a pinch, but the results won’t be quite as good. If possible, freeze the book spine down, and supported so it won’t lean or fall over. If you have to lay it on its side, make sure that the book is fully and flatly supported. If you have anything under it smaller than the book, the book can and will mold itself around that object. OK. You’ll need a home freezer (once frozen commercially, the books can be stored in a home freezer without a problem), and a hair dryer. Start with the cover. Open the cover (gently pry loose the inside page, if it’s sticking). Run the air stream from the hair dryer (I’d recommend top settings on both heat and fan) over the cover, back and forth, top to bottom, and inside and out. When it feels dry and warm to the touch (not hot!) go on to the inside page. Same procedure. Smooth the page with your hand as you work. Work page to page this way. When the next page starts to feel wet to your fingers, stop. Stick in a piece of paper as a bookmark, and put the book back in the freezer. Take out the next book (if there’s more than one) and start on it. Leave the first book in the freezer for at least a day. 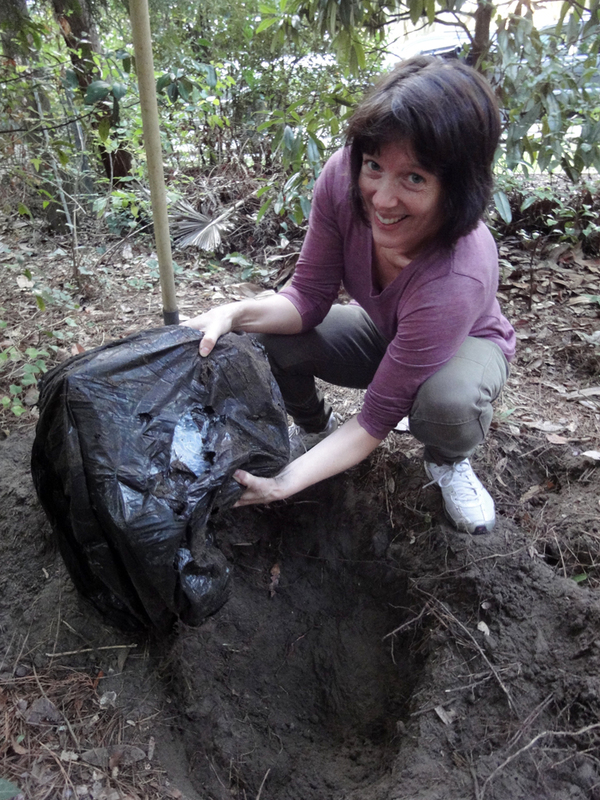 Covers may soak up more moisture than the pages, so you may have to do the cover several times. Just keep the book frozen, and work only so long as it’s frozen, quitting when it starts to thaw. T, get thee to a freezer!